This is the life story of a kind and well-respected man, one of nature's gentlemen, who was well known to many vintage vehicle enthusiasts and historians. Geoffrey Stevens died at the age of 95 on 11th August, 2008 after a short illness. He was one of our last direct links with early vehicle manufacturing in the Black Country, and will be sadly missed. 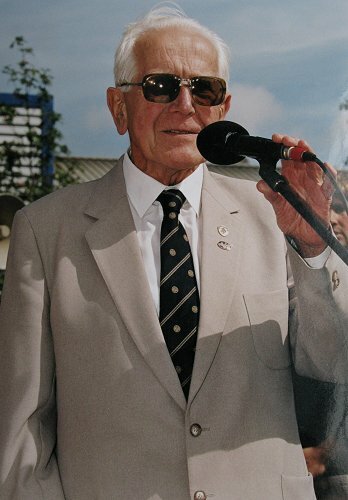 Geoff in 1996 at the unveiling of 'The Lone Rider' statue. Courtesy of Peter Stevens. I would like to thank Peter Stevens for providing much of the information, and some of the photographs that can be found in this section.